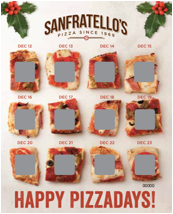 As a gift to its patrons, Sanfratello's is doing a 12 Days of Pizza promotion with an opportunity to win FREE pizza for a year. Sanfratello's is a southside favorite - I'm especially fond of their deep dish pan pizza. Every card is a winner and prizes can be claimed from December 12 through February 28. One large single-topping pizza each week for an entire year. Your choice - thin or pan. There'll be one winner at each of our stores! Pizza party for 10 (carry out or delivery). One winner at each store!